Hidden in plain sight. Thus would I describe the esoteric and occult symbolism of the sacred space of Washington, D.C. Sit down with a map of the city, a pencil, ruler, protractor, and compass. You can draw pentagrams and hexagrams, triangles, crosses, and other multi-angled geometrical constructs that will fill the pages of books and Internet websites with potentially erudite speculation and amazing detail. Many people have and many more undoubtedly will. On the other hand, as we walk through the streets of Washington, D.C., in the pages of this book, we will enter an eternal world populated by archetypes in stone--carvings, monuments, statues, buildings, and inscriptions. Like hierophants of the mystery schools of antiquity, they silently communicate a curriculum designed to inspire, elevate, and teach eternal Truth. Washington, D.C., like Jerusalem or Mecca, offers a pilgrimage for those who seek a greater understanding of the miracle of their homeland, and for visitors from other shores who come to glimpse the hope of the first great free nation on earth. Washington is the central shrine of America’s national religion. This is a nondenominational faith, in line with the Masonic ideal, capable of being shared by all who recognize God as that which has created and sustains the universe. Such is the primal deity worshipped by Christians, Jews, and Muslims, yet it is also the basis of Hinduism, Buddhism, Confucianism, Paganism, and the New Age faiths--in fact every religion and spiritual path on earth. We glance at a sunrise or sunset, a flower, the night sky, a sculpture or painting, the eyes of a baby or a beautiful woman. This is the God in whose name we live and breathe and have our being. And despite any and all imperfections in our society--whether it be the greed of the rich or the irresponsibility of the poor--it is the goal to which every person of good will aspires. The sacred interaction between heaven and earth is continually mirrored in the iconography of Washington, D.C. The most prominent is the Washington Monument, symbol of the human will aspiring to the heavens while remaining firmly rooted on earth. Washington was the first president, the victorious general helping win our freedom, the conscious model against whom all leaders are judged. Yet, his monument offers a profound statement of impersonality, an expression of both the most austere severity and elegant symmetry, a far cry from the cult of personality dominating modern politics. The Lincoln Memorial is a Temple erected to the dream of equality before the law for all people, and of the indivisible nature of the American Union. Lincoln is a modern sacrifice, an offering upon the altar of justice. It is ironic that the nation that dared to aspire to freedom was mired in the ancient institution of slavery. This stubborn holdover of the Colonial era ultimately resulted in the greatest loss of American blood in our history. Its unholy remnants still stain our national self-image. Lincoln sits in mute contemplation to remind us that evil will not be tolerated by the forces that direct and sustain this country, that our duty is to rise beyond the errors and sins of our nature. On the steps of the Jefferson Memorial, we begin our ascent to the world of pure thought, what the Buddhist calls “clear mind.” Standing proud and tall among some of history’s most inspiring words, Jefferson gazes upon the city he helped design. His eyes are filled with understanding of the vicissitudes of fashion and the temptations of the ease of the moment. His will held firm, he counsels us to persevere with resoluteness on the course of liberty. In his open rotunda, whose dome resembles an astronomical observatory ever seeking intimacy with heaven, he advises us to take the long view, that of the eternity in which he now lives. Continue on to the Capitol, the Temple of Liberty. You will be surrounded by a magical pantheon of those who created a free nation. Look up at the painting of the Apotheosis of Washington some 180 feet above you. Its outer rim proclaims that the gods of antiquity still walk among us. Minerva leads the way in science, rejecting superstition and “consensus,” insisting on penetrating to the heart of reality with objective experimentation. Ever-active Mercury continues to inspire commerce as he did in Rome over two thousand years ago. For he knows that those who close their minds to the swift interchange of mutual self-interest and prosperity have little reason to maintain peace when conflicts arise. Neptune rules his watery realm, raising his trident of power to remind America that he controls some 70 percent of the surface of the earth; that the nation which does not sail mighty upon the sea will fall to the one who does; and that free access to shipping and fishing are as important today as ever. Ceres speaks similar words, pointing out that cultivation of the earth is the lot of human beings. Those who are successful in learning her secrets and pursuing her disciplines will prosper. Those who do not will wither and die. Vulcan leads his workers to the realization that we are put on this earth to build and fashion and construct. Humanity is made up of tool-wielding beings designed to imitate the creativity of their maker. Finally Columbia, the female personification of America, wields her sword in fiery demonstration that freedom is not free. It must ever be defended, protected, and earned--sometimes through the age-old ordeal of trial by combat. Washington, D.C., is simultaneously a hymnal and a history book, a shrine and a university, a prayer and a symphony. It is a memorial to truth in a culture of lies, a beacon of freedom in a world of tyranny, a ray of hope in a darkness of despair. Let us explore together its invigorating vision of courage and liberty, morality and lucidity, creativity and joy. "The Secrets of Masonic Washington shines a spotlight on an unusual area of Washington, D.C. that few of us have ever realized. It is a historical study of masonry and how it is embroidered into the development of the USA. At the same time, the book is counter-balanced with photos of historic sites and statuary found in today’s Washington, D.C., revealing masonry’s remarkable influence up to the very present day. This is one of the most interesting visual and literary walking tours of Washington, D.C. that I’ve ever taken, and I recommend it to any student of government, history, or art." "If you are planning to visit the Capitol, you really could benefit from having this book in your shoulder bag. It is well worth the cost and, even if you never go to Washington, you can still enjoy the wonderful images contained in it." 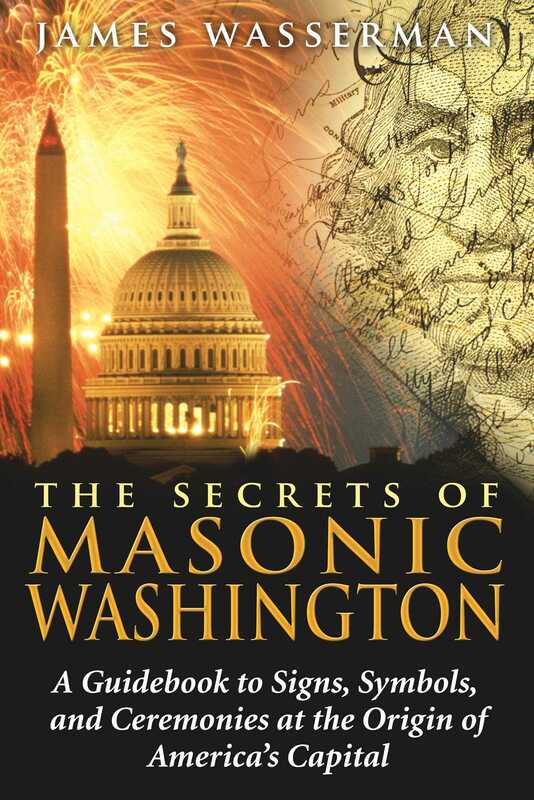 "A treat for those who are intrigued by the possibility of secret societies and their impact on the world, The Secrets of Masonic Washington is a fine and intriguing read that has much to be enjoyed." " . . . truly comprehensive. The collection runs through the expected, and the unexpected, with many dynamic images to illustrate just how 'hidden in plain sight' much of the Masonic symbolism is. . . . chillingly posits that if we have not the courage to embody the principles that these monuments commemorate, then these testaments will be all that is left us and our failure will relegate us to history." "Those following Wasserman's trail will be exposed to images of individual strength and courage; to repeated representations of the power and primacy of law as guarantor of individual rights, learning and sciences. Values are being conveyed here, priorities stated. . . . Part of the insight Wasserman shares with readers is the appreciation of the extent to which Thelemic ideals are already integrated into the structure of American society and government (if not always perfectly expressed!) and openly celebrated in the public art and architecture of Washington, D.C. So, mote it be!" "The national memorials to our country's great and greatness are physical testimonies of the collective vision that leads us. In Wasserman's tour, we can find outright Masonic emblems and symbols, allegorical representations of Masonic tenets, art and architecture produced by or illustrative of Freemasons, and buildings and statuary that are not Masonic but portray concepts and ideals that reflect Masonic thought. . . . The text is recommended for novice and veteran Masons alike who want to better understand our national heritage and search for Masonic ideals illustrated in the federal city." "Most histories of Freemasonry focus on how the new ways of thinking, triggered by the Enlightenment, were manifested in the taverns and coffeehouses in Europe along the lines of the ancient guild system. Therefore, I found Wasserman's theory of how this pre-established concept was transplanted to the fertile soil of the colonies, consequently influencing the emerging American political philosophy, to be fascinating. . . . I would definitely recommend this book, both as a companion guide to Brown's The Lost Symbol and as a tour guide for those either living in or planning to visit Washington, DC." "Anyone familiar with Wasserman's other work would know that of anyone, he is extremely suited to provide a 'guidebook to signs, symbols, and ceremonies at the origin of America's capital.'" "[Wasserman's] text, illustrated with color and black and white photographs as well as maps, shines light on the Masonic symbolism, meanings, and purposes hidden within the layout, architecture, or art of each location. This valuable guidebook will appeal to students of US history and esotericism alike." "Despite one's theological and/or philosophical approach to life, the impact of Freemasonry has been enormous. For these days and times that 'try men's souls,' I suggest Wasserman's book is both highly informative and very interesting."